Inscriptions: u.l. handwritten in pen: "34"; u.r. hadnwritten in ink: "Color / orange ed flourescent background / hand + printing + big I in black / drop out lines of hand where they go into the big I (will be orange) background showing thru"; l.r. handwritten in ink: "writing enlarged as much as possible / to fit from top to bottom"
"Untitled." Corita Kent in the Grunwald Center Collection. 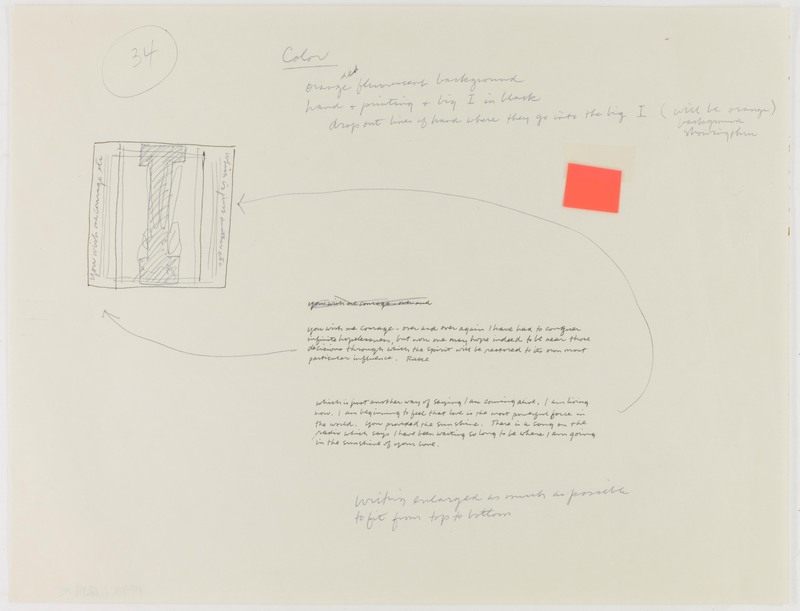 Los Angeles: Hammer Museum, 2017. https://​hammer.ucla.edu/​collections/​grunwald-center-collection/​corita-kent/​art/​untitled-preparatory-material-for-i-i-am-coming-alive-5241/​.